As you all know, my little Zayn has sensitive skin. Around 6 months old, my Zayn started to have little dry patches appear on his skin. It slowly started on his biceps and then I suddenly noticed small spots around his calves. I didn’t take it seriously because I thought it was just dry skin. I tried moisturizing and introducing oils, but the patches didn’t go away. I went to our pediatrician for our 6-month visit and showed him Zayn’s dry spots. It was his doctor that told me I should switch his bath products to AVEENO® Baby. As soon I did that, I noticed significant improvements in his skin. He was back to having his baby soft skin with zero dry patches. This is the reason why I accepted when the wonderful folks at AVEENO® asked me to become their ambassador this year. Oh, by the way, I also noticed that my skin started to get soft too because we would take bath time together and my skin was also exposed to the same wash & shampoo! 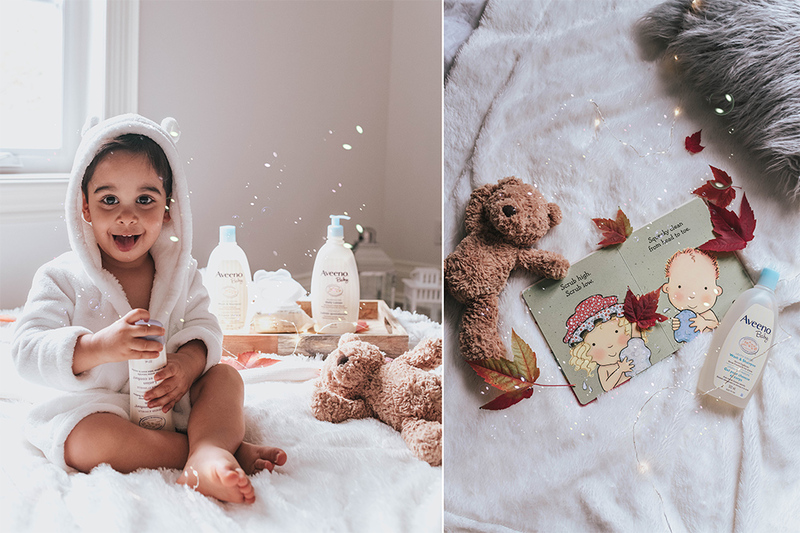 The secret – I think it’s because it has a natural oat formula , so all you get is a super gentle baby wash that’s perfect if your little one has sensitive skin. For the last year, bath time has evolved significantly. I went from giving the twins a bath in their portable tub to getting involved by joining them in a tub and playing tugboat and sticking alphabet letters around what used to be my bathtub. 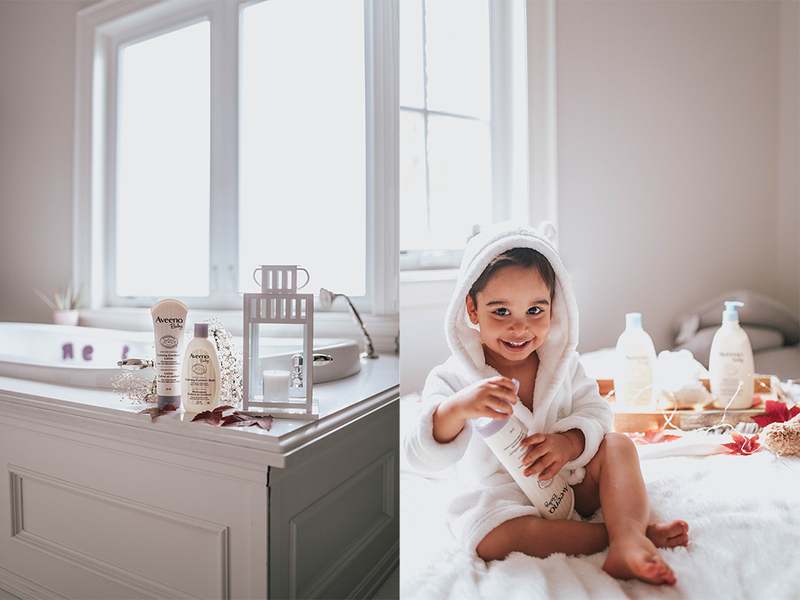 At the end of bath time, our skin smells sweet and feels super soft thanks to AVEENO® Baby Wash & Shampoo. After bath time, I’ll put the twins in their bathrobes and give them a massage with AVEENO® Baby Daily Lotion. This has helped Zayn keep his skin moisturized and smelling sweet throughout the day (even till the next morning) and his toes taste really yummy when I nibble on them! Now I know you are wondering about Reyha, what do I use for her during bath time? 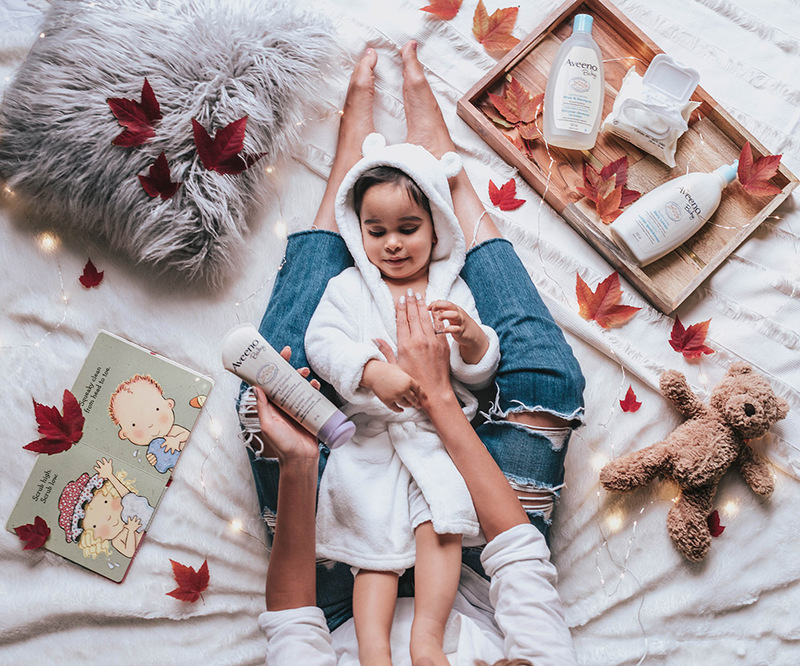 I actually use the same products as Zayn but, there are times when I want her to smell girly, so I’ll use the AVEENO® Baby Calming Comfort Bath. It has a lovely sweet lavender vanilla scent, plus it also contains an oatmeal formula, which her skin is familiar with from Zayn’s wash & shampoo. 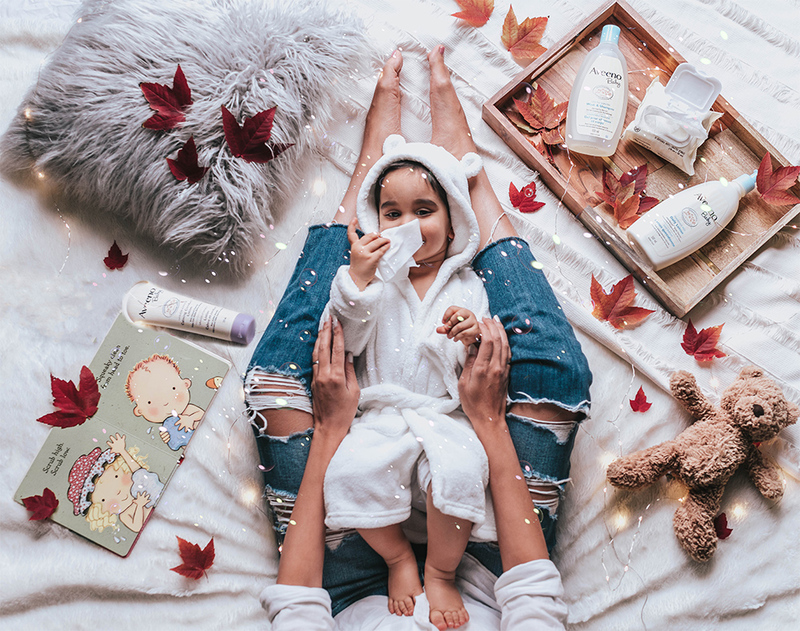 Every night, before bed time I’ll use the AVEENO® Baby Calming Comfort Lotion on her because it helps relax her, so she can have a nice and restful sleep. Plus, she smells so good!! Disclaimer: This post was sponsored by AVEENO® but all thoughts are opinion are my own. Your photos are sooo adorable dear! Oh my goodness all of these photographs are absolutely stunning! You are honestly so talented when it comes to beautiful photography. Definitely photos to cherish. Thank you so much Amy! It was a joy putting this content together. Plus let’s face it, we all feel warm and cozy after that nice warm bath with Aveeno.